Some busy weeks are here for me, and so I have decided to put a pause on the Sew it Chic series for a short while. I hope by next week I’ll be able to share some news and you’ll understand why things are going to be crazy around here for the rest of the summer. This news also means less sewing this summer….wah! But it should be great in the long run! 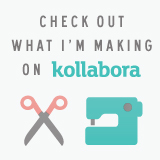 I had the pleasure of being the Featured Maker over on Kollabora.com this week. You can read my interview here. To coincide with the feature, the ladies at Kollabora asked if I would like to put my patterns on sale on their site. Of course I said yes, that sounds great. So Monday I marked down my patterns from their original $6.95 to $5.50 for the sale. But the sale actually started on Tuesday, and so they didn’t know I had already taken a markdown and marked them down another 20% to $4.40! So, what I’m saying is, if you’d like to try out one of my patterns, they are marked down 40% over on Kollabora so get ’em while they’re hot (until June 30th)! I love a sale! The party is open for a week, until next Friday. Look around and share a comment or 2 with a neighbor. I don’t mind admitting that I savor blog comments as much as a new manicure. They are encouraging and build community. This week for our Sew it Chic feature we have Melissa from Mahlica Designs. Last week she linked up her Maria Denmark Kirsten Kimono T that she paired with her Itch to Stitch Lindy skirt and I just had to tell her that I had made an outfit out of the same 2 patterns! We’re twinsies! Melissa makes a wide range of cute things (and even has an Etsy shop here), but right now she is working on a core wardrobe that is thoughtfully planned. It is very fun to see her progress. I loved my wardrobe project so much and have been wearing all my items like crazy. It helps so much to have a plan in place! What is your motivation to sew? I’d describe it more as an innate drive. I’m a creative being and when that creativity does not get to flow; I feel quite twitchy, grouchy, and overall unsettled. I’ve dabbled in many different creative areas in life but sewing has been the enduring mainstay. Sewing satisfies my creative needs in several ways. First sewing is tactile. Throughout the process, I’m getting a sensory experience through touch. Sewing is a delight of textures; paper, cloth, metal, flat, bumpy, soft and rigid just to begin. Secondly, I’m making a real, interactive, usable item. I’m not creating only for creativity’s sake, but the results of my creative effort are ever present (as long as the item lasts anyway) in a wearable garment or usable item. Right now my favorite part of sewing is the satisfaction of wearing what I make. I feel good when I put on hand made clothing. I’m reminded about the loving care that goes into handmade items; that I am having a positive impact on the world by opting out of fast fashion; that I’m a member of a community of people who love like I do. What is your least favorite thing about sewing? The constant reminder that I am failable. I mess up all the time. Sometimes it’s the good “Lesson learned” kind of mess up, but often it’s the “Haven’t I figured that out yet” kind of mess up. What is the most recent thing you’ve learned about sewing? The value of repeating. Up until recently, I rarely made a pattern twice. Notes on what to do better next time became this ethereal thing not easily applied to future projects. Learning to sew with knits and making my own tees has opened me up to really working and reworking a pattern until the fit is right. By repeating a project to get it better the second or third time, skills and knowledge are really solidified. I totally agree with Melissa about repeating a pattern to perfect the fit, which is why I still have one more Aurora tank to share! You will see that soon. In the meantime, let’s see what you are making! The party is open for a week, until next Friday, and I’ll open a new one Saturday. Feel free to link up every once in a while or try to complete a garment every week! Look around and share a comment or 2 with a neighbor. I don’t mind admitting that I savor blog comments as much as a fun and fast waterslide. They are encouraging and build community. Here we are again for another Sew it Chic in a Week. I am on the road again, this time for an unexpected funeral, so I didn’t get an interview done AND I have to put off finishing my last Aurora tank. It is cut out and started, but I will finish the series upon my return and if you complete a Seamwork Aurora tank before Monday, please let me know so I can include you in my round up post. I have only seen a few thus far, and there is plenty of time to sew one up and get included since it really does take only 2 hours. Now that I’ve made 4, I’ve got it down to an hour and a quarter. Cute and easy — I love this pattern! Please note that my friends Chris and Ali are “Jumping into June” and both made awesome jumpsuits. I just have to join in, don’t you? I’ve seen some cute ones made up and I noticed on a recent purse shopping excursion that there were quite a few in the stores, too. All in one dressing that makes you look fierce and edgy! Also, it is The Monthly Stitch’s Indie Pattern Month. If you are sewing from an Indie pattern, you may be able to enter one of their contests. Each week is a different theme, and dresses week was so amazing! I love the community at The Monthly Stitch! Look around and share a comment or 2 with a neighbor. I don’t mind admitting that I savor blog comments as much as a fun-filled vacation. They are encouraging and build community. I love the Green Winter Street dress that I made for the Pattern Review Surprise Sewing Bee last year! I feel like a million dollars in it. But, I don’t get to wear it often. It is a bit much for everyday, which is sad. So, I am paying homage to that dress by using the same fabric combo again in this version of the Seamwork magazine Aurora tank. It makes me think of the original dress, and that makes me happy. Recap on the fabrics – a french terry-ish knit that was labeled “Juicy Couture” on the remnant table, and the leopard is a very fluid knit that is soft as a baby’s bottom. They are both fabulous fabrics! I wish I had more of both of them, but at least I have used them twice and have enjoyed them thoroughly. I made this with the same adjustments as before but scooped out the armhole just a bit and it is now perfect. Warning – this tutorial is a tricky move on the Aurora tank because of the gathers. If it was just a straight join it would be easy peasy. But there is much fiddling and working with it to get it all lined up and not puckered. I know that is why Colette did not recommend this method when writing the instructions. I’d guess it adds 15 or 20 minutes to the sewing time. To join the shoulder straps cleanly, first sew the yoke pieces at the back neck and both armholes, right side to right side, following the pattern instructions. Leave the yoke inside out. Then stick a safety pin into the top of both the front pieces where you have already gathered and finished armhole and neckline edges. Use the safety pin to feed the front straight up into the inside out yoke, keeping the front piece as flat as possible. I recommend threading both through at the same time to ennsure they are both facing right side up and nothing gets twisted. When it is up through the top of the each yoke strap, straighten the gathers. Take each side of the gathered piece and carefully place them tightly into the side of the strap opening. smoothing your gathers evenly across, then pin. My pins are crookedly shoving those corners tight against the edges. Sew straight across the strap, perpendicular to the pins. I don’t trim my edges until I pull it out and see how everything lined up and how my gathers look. If it isn’t perfect you can always try again. Pull the front right out and take a look! It is like magic! Now the join of the strap and the front are fully enclosed and are not going to flip out or ravel. I used this technique on all my Aurora tanks and I think it is such a nice touch. Here is the first outfit I tried with my new leopard Aurora tank– I decided the greens didn’t match so I changed, but I love the vibe of the maxi skirt and the top. Maybe I should make a skirt that will match? Here is my hot pink Seamwork Aurora made with a chambray yoke. I was right that a woven fabric could work! It is another cute, comfy top and doesn’t it go great with my Ikat Jamie jeans? I am completely handmade in this outfit. To compensate for the lack of stretch, I added 1/2″ to the width of the yoke back. That worked fine, but this pink hachi knit from fabricmart.com grew immediately upon wearing. It is lovely and soft to wear but it got a lot wider around the bust and it makes the armholes look too wide. It is just a characteristic of the fabric that I didn’t know to compensate for. Not a huge deal, though. I’m just getting nit-picky with my 3rd version. To create a clean finish with the ravelly chambray, I changed the construction a little bit. I sewed the back onto the top yoke first, before sewing the armholes and back neckline. Then I sewed the armholes and back neckline of the 2 yoke pieces right side to right side as instructed in the pattern. I did have to clip the rounded back neckline a little bit to get it to lay flat. Then I used my handy trick (that I promise I am writing a tutorial for) to enclose the front straps, pulled those through so all was right side out, then folded the facing yoke piece under before sewing a topstitch to catch it down. It looks neat and tidy and everything is enclosed! I half tucked the front into my jeans, but I still prefer the length pretty long so I have options. What do you guys think? The soft, stretchy and growing knit makes this tank much more slouchy. A very different fit with the new fabrics! Oh yes, I knew this pattern (Seamwork’s Aurora) would be a winner. I love this tank top! The body is made from a whisper soft jersey that I found on the remnant table at my beloved Pacific Fabrics. The lace on the yoke is a random poly lace I found at the thrift store. It has less stretch, but I am not totally sure you need much stretch for the yoke piece. Spoiler alert – that will be my next experiment! Trying out a woven fabric for the yoke. I made a fair bit of modifications after my first try yesterday. First, I scooped the neckline down 1 3/4″. I have a handy Vary Curve for this job, but you might need to eyeball it if you try this. Be sure and true up your front neckline so you don’t accidentally get a V-neck or an upwards point. To square it, use a 90* angle (a ruler or a piece of paper work fine) to make sure the fold line and the neckline meet at 90*. I also lengthened the yoke straps about 1/2″. The taped together pattern had an intersection that made it easy to break apart and retape. Do note that lengthening at that specific spot did widen the straps a tiny bit. That worked well for me, since I always like a wide neckline. But to make the front width match I had to move the top of the front piece 1/8″ away from the fold when cutting it out. That did the trick! I still feel the armholes are a little tiny bit high. I’ll cut that down on my next version. But since that armhole area is made of knit, it is not uncomfortable. So, what do you think? Another cute tank in a fun fabric combo that I will be able to wear all through the summer. Here I am wearing it with my white Lindy Petal Skirt, but I think it will also look great with my cut-offs. See you tomorrow — same bat-time, same bat-place! Summer has arrived and I’m woefully unprepared. I’ve been obsessed with making jackets and now that I’ve made my floral moto, I want to make all the motos. But jackets take time, and at this moment at least, are not very seasonally appropriate. So I’ve decided to take a bit of a pause from that and spend a week making a bunch of the new Aurora tank from Seamwork magazine by Colette. Why the Aurora, do you ask? Well, because I love it, obviously. Ha! Let me elaborate. First, it is knit, which makes it stretchy and comfy. The fit is snug in the bust but relaxed in the waist; my favorite. It only takes a 2 hours, so I can make a whole stable of them for the warm weather. Best of all, you can mix 2 fabrics!!!! Oh do I have some fun combinations in mind!!!! So every day this week I will be making and showing off another Aurora tank. I’ll perfect the fit and use up some of my knit stash. It will be a very useful addition to my wardrobe, I think. Would you like to join me? I will round up all the Auroras I make in a post, but I would love to include yours if you want to make one or two, too! It would be great to have a whole gallery of them to share the possibilities of this cute pattern. You can link to your version in the comments or email me pictures if you don’t have a blog. Be sure and include details on what fabrics you use, so we can see what works well! My first version I sewed up a straight size small in an athletic mesh and raspberry ITY knit. Well, I added 2 inches in length of course. It is cute! I’m liking it so far. Some notes: It is a bit snug around the bust, but this mesh is less stretchy than some other knits I will be using. The thing I don’t like is how the pulling distorts the cute gathers at the strap attachment. Will that happen in the other versions, even if the knit is stretchier? I am tempted to just add a half inch in the bust. The neckline is very modest. Since the mesh of this version is transparent, a higher neckline is appropriate. But in future versions I’m going to drop that neckline by at least an inch and a half. I will show you that alterations when I make it. I love the shape of the hemline! One of my favorite features. I followed the directions closely, except for connecting the front straps. I deviated by clean finishing the strap connection and will post a tutorial on how to accomplish this. It is tricky to visualize, so I will have to take some pictures and maybe draw some diagrams. But it looks so much better and will hold up better over time, also. So that’s the start of Aurora week! I’m heading right back into the sewing room to cut out version number 2! Meet you back here tomorrow. Another week has flown by as I play catch-up from my trip. Doesn’t it seem like you spend nearly a week preparing for your trip by planning, completing projects, packing, cleaning your house…then you go on your trip. Fun! Then it takes another week of recovery by doing laundry, work, and family responsibilities? I am just now calming down enough to sit at my sewing machine again. Peek at my fabric haul! Right now I am muslining some patterns so I can sew up my beautiful new fabric from LA. I am also muslining up a new dress design. Don’t hold your breath for that one, folks, since I am the slowest designer ever. But in my head it is cute and just what I want to wear all summer. Yes, I know, I should get a move on if I want to wear it for even a portion of this summer. Maybe it will be ready for my Australian and New Zealand friends? What’s your motivation to sew? I sew as a creative outlet. I used to paint and draw, now I sew, and sew. I love the colour, fabric and the magic of creating something new. I also love that I get to wear clothes that fit, in colours I like, in fabrics I probably couldn’t afford in ready-to-wear clothes. I also enjoy being part of the sewing blogging community, have met some lovely people and I am always inspired and learning something. My favorite thing about sewing? I like that I’m always learning and improving my skills. I like planning and dreaming about my next make. My imaginery sewing list is so long. My least favorite thing about sewing? I think it’s putting together pdf patterns and then storing them. Though I’ve just figured out a solution to this, so something I’ve learnt recently about sewing is, to trace the pdfs to vilene. They are then easy to store rolled up in cardboard tubes. A vilene pattern can be written on, is strong and is also easy to use, often not even needing pattern weights. Thanks for hosting this link-up Helena and happy stitching everyone.